What do you use to hydrate and moisturize your body skin? If you have a dry skin type (face) chances are your 'body skin' is no different. My skin is dry in general so I always have to use some kind of body moisturizer. 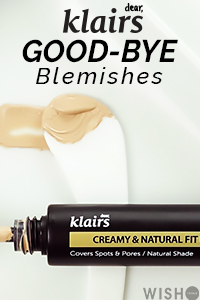 In the spring / summer I like to use a very lightweight cream that absorbs fast, my skin is already sweating so no need to clog it with heavy creams. In the winter time a more rich body moisturizer feels good on my dry skin, but shouldn't be to sticky. As kbeauty products make up my entire skincare routine, I wanted to try some Korean body care products. When I was browsing on ebay for new stuff I saw the Sulwhasoo Essentrue Body Serum and the History of Whoo SPA moisturizer on auction, in sample sizes. Sulwhasoo is one of my favorite brands and I love the hangang smell, so I thought why not try it. History of Whoo is a luxury brand from LG (its a rival of Sulwhasoo obviously) which is even more expensive, I haven't tried any products from them yet it would break my wallet. Sulwhasoo describes the product as a Korean herbal medicinal body serum containing natural essential oils for deep hydration and nourishment. 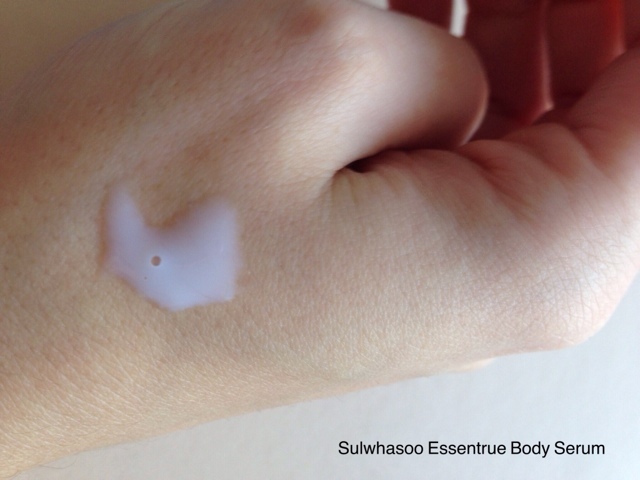 The Sulwhasoo essentrue body serum is a very lightweight moisturizer that is quit fluid, that's also in the name 'serum'. The moisturizer contains a complex of natural essential oils including Pine Nut Oil, Lotus Fruit Oil, Camellia Oil, Prunus Mume Oil, and Apricot Kernel Oil. I use a small amount for my entire body, the somewhat oil-like but not greasy serum penetrates fast upon application and leaves my skin soft without feeling heavy or oily. The scent is very gentle 'hangang' the classic Sulwahsoo signature scent. If you like how Sulwhasoo skincare products smell then you will love this body serum, the smell is just amazing. I don't remember the exact price I bought it for, but I think it was around 5-6$ on ebay for a 20ml sample bottle. If you have a Sulwhasoo counter near you I would say just ask them for some free samples. If you can find the retail price of this product please let me know, I cant find it anywhere but imagine it to be in the same price class as the history of whoo moisturizer. The Whoo Spa moisturizer is a History Of Whoo bodycare product that is highly enriched with concentrated active herbal ingredients, yes its another hangbang body moisturizer. The consistency of this moisturizer is less very liquid than the one from Sulwhasoo. Its like a creamy -oily transparent liquid. I was so surprised when I rubbed it into my skin, the moisturizer absorbed within a few seconds, without leaving my skin sticky or oily! I actually didn't believe it at first, but when I applied it on my entire body it felt like my skin drunk it up. 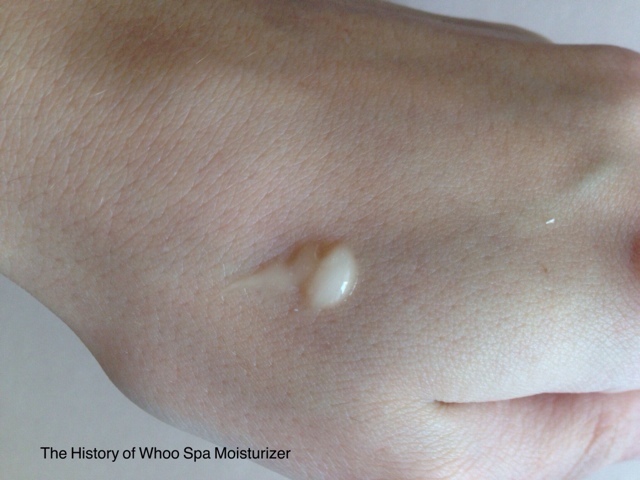 My main issue with fast absorbing body moisturizers is that they leave my skin feeling dry, but that's not the case with Whoo Spa moisturizer, my skin felt soft and hydrated. The only thing I dint like much is the scent, it smells a little bit of unisex perfume . I was a little bit disappointed, my nose didn't pick up any hanbang scent. The fragrance is not unpleasant but I expected something more herbal. I bought 10 sample sachets x 5ml for like 3-4$ on ebay. The full body moisturizer is available on Amazon for 45$ and for 38$ at koreandepart. Its expensive but I could imagine buying it when I'm in the mood to treat myself, if only the scent was more pleasant. However, its the most fast absorbing and at the same time hydrating body moisturizer that I ever tried so definitely worth a try. I think that the formulation and consistency of the Whoo spa moisturizer is more special than Sulwhasoo serum, it's so fast absorbing. 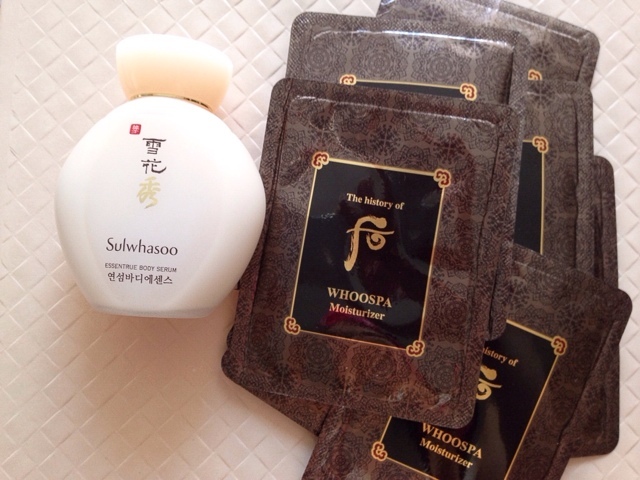 Sulwhasoo smells better and is more lightweight and fluid. 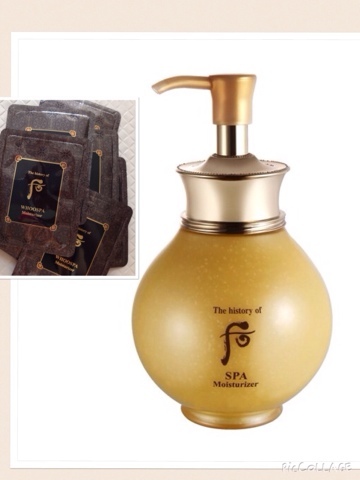 Both products are fast absorbing and very moisturizing, the Whoo Spaa is slightly oilier. Nice products but not cheap, I don't think that body moisturizers are worth that money, only if you want to treat yourself and are a fan of Korean hanbang products;). Thank you for this review! Both of these products sound really nice and I personally very much like the Korean herbal Hanbang scent! Though I do not have dry skin, I do like to use body oils in the winter time, which is quite harsh here in the PA mountains, to keep my skin well hydrated. I have several (mostly non-Asian) and apply them to my skin right after showering in the morning. This seems to hep retain the moisture already on my skin as it dries and also imparts a very nice overall scent to my body. Whatever remains on my hands after applying to my body, I wipe onto my face as this acts as a nice lubricant for irritation-free shaving. I was curious as to the price for the Sulwhasoo as I love most of the Sulwhasoo products I have tried. It was not available at any US-based source I could find, but I did find a price of $57.90US at the below link, which makes it much more expensive than any other body oil I have ever used. I couldnt find the price for the sulwhasoo serum but guess its around 40-50$ or even 60$ at some places as you mention. Yes its expensieve for a body moisturizer, I wouldnt buy it now for myself only maybe if It was on sale or I wantend to treat myself ) but the price doesnt surprise me as its sulwhasoo.